I know that many readers find it easy to remember golf rulings when they see, or hear, about other players’ breaches, especially if they are highly-paid Tour Pros. I recently came across this YouTube video of an incident concerning Retief Goosen, on the 17th hole of his first round in the 2006 South African Open. I find the whole 4+ minutes clip interesting as it shows Retief making some very strange club decisions, as discussed by the two commentators. However, the frames relating to the subsequent Rules issue are where he marks his unplayable ball dropping area at 1:46 mins and where the dropped ball first strikes the course at 2:51 mins. After completion of his round Retief Goosen was advised by European Tour senior referee, Andy McFee, that he had been penalised two additional strokes for re-dropping a ball that was in play after his first drop and so playing from a wrong place (Rule 20-7). 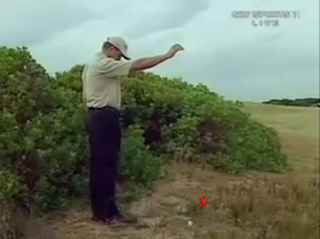 In the frame below, taken from the video, I have attempted to stop the sequence at the point where Retief’s dropped ball first hits the ground and have identified the place where he had previously marked the two permitted club-lengths with a red X, as his tee marker is not visible to us. In my opinion, having replayed this clip several times, I think that the penalty was harsh and would probably have given the player the benefit of the doubt. In fact, the two strokes penalty gave him a total of 11 strokes on this one hole, a sextuple bogey! Amazingly, he came back with a birdie on the last hole of his first round and was the eventual winner of the four-day event. "He thought he had to re-drop. But you only do so if it rolls more than two club lengths from where it strikes the ground. His ball didn't do that, and it also didn't roll nearer the hole so his ball was in play. As soon as he picked it up to re-drop he incurred a one-stroke penalty. If he replaced it on the exact spot from where he lifted it, it would've stayed a one-stroke penalty. But because he didn't replace it, it became a two-stroke penalty and the nine became an 11." If you are looking for a handy reminder of the main amendments to the Rules of Golf for 2012 - 2015 please click on this link. You are welcome to print out the notice and post it on the notice board of your Club or Society. Click here to join ‘Rhodes Rules School’ for free weekly emails on the Rules of Golf. Ian Baker Finch said on TV last year that the rule might be modified so that a player places the ball instead of dropping it once or twice. This proposed change is quicker, easier to remember, more logical and in some ways fairer. It short cuts directly to the present procedure after the dropped ball has rolled away more than 2 clublengths twice-in so it is a short cut rather than a change. Certainly the rule should be thus for relocating a ball in casual water in a wet bunker. Dropping creates an awful lie quite unreasonably. Well, Ian Baker Finch was obviously wrong, because there will be no more changes to the Rules of Golf for at least four more years. Also, as someone deeply interested in the Rules of Golf, I am not aware of any significant body of opinion promoting such a change. With regard to casual water in bunkers, my experience is that in these conditions the sand is usually compacted by the water and when you drop your ball outside of the water you are far less likely to have a 'fried egg' situation than when your ball drops into dry sand following a wayward stroke. Bunkers are 'hazards', which players must try and avoid. I do not subscribe to the view that bunkers should always have premium grade sand that has been expertly smoothed, so as to make exit from them easier for players. We already have a situation where pros will sometimes aim for bunkers rather than risk being in 2-3 inch grass on the fringe of a putting green. I've got a different take on the video. It looks like Goosen thought that the ball hit the ground OUTSIDE the 2-club-length arc. However, if that were true, why didn't he pursue his case with the rules official? That is the unanswered question. I cannot find any reference to Goosen's reason for picking-up his ball. From Andy McFee's comments at the end of my blog I suspect that he did not fully understand the Rule and picked up his ball for the wrong reason, though that is by no means certain. I find it interesting that there was a lack of communication between the player and caddie...a caddie should be watching carefully the drop so he can offer his opinion as to whether it was within the 2 club-lengths. I think the Goose thought the drop was just outside...therefore drop it again within..no penalty right? for doing that. I certainly agree that part of a caddie's job is to ensure that his player does not incur any unnecessary penalties. Like the pros themselves they should be experts on the Rules of the game that provides their living. If Goosen's drop first hit the course outside the permitted two club-lengths area it was an invalid drop. In this case, the player must drop the ball again without penalty.